This year the idea for our excursion came from Heinz. Heinz had of course really done his homework and gave us plenty of information about the tragic fate of the Cossacks before we had a needed coffee break on our way to Lienz. Our big thank you goes to him for all his work. In late May and early June 1945, more than 20,000 Cossacks – men, women and children – were forcefully deported by the British Army between Lienz and Oberdrauburg and handed over to the Soviets at Judenburg in Styria. These tragic events have not been forgotten – there is a small cemetery near Lienz, at the former site of the Cossack camp, and a Friedensglocke on a mountain high above the town. Although not very pleasant, the episode undeniably provides a link between the Tyrol and Great Britain – reason enough for the Austro-British Society Tyrol to choose Lienz as the destination of this year’s excursion. Eighteen of us came along, including two guests from Australia, all shepherded through the day by Hazel who had done her usual best in organizing the day. Not surprisingly, it went smoothly and to everybody’s satisfaction! The Cossacks, we learned on the coach, had ended up near Lienz after a long and excruciating Odyssey. Originally they fled the Bolsheviks when the German Wehrmacht withdrew from the steppes to the south of the Don River. They hoped that, although some of their men had fought on the side of the Nazis, the Western powers would understand their predicament and offer them a place to settle somewhere in the New World. The British Army, on the other hand, had fought its way up the Italian peninsula in a hard and drawn-out campaign. It fell to the 8th Argyll and Sutherland Highlanders to occupy the area between Oberdrauburg and Lienz and thus to deal with the Cossacks. In the beginning, relations were good enough, even friendly. However, foreign policy soon interfered. At the Yalta conference between Stalin, Churchill and Roosevelt in February, 1945 it had been agreed that all displaced persons should be repatriated after the war. Normally, this should not have been a problem – who wouldn’t want to go home? But Soviet citizens very often did not, knowing all too well the nature of the Communist regime. It was decided by the British Government that they should be sent home anyway, by force if necessary. This resulted in nasty scenes in the Peggetz camp, just east of Lienz. There were suicides, mothers killed their children rather than subject them to a life in Soviet camps, and a number of persons were shot while trying to escape. Today, the small cemetery near the site of the violent scenes commemorates the sad fate of the Cossacks – both those who died on the spot and those who were deported to a life of prolonged misery and, all too often, death in the infamous GULAG camps. Our thanks to Mrs. Pätzold for her well-informed and sympathetic introduction to the place. 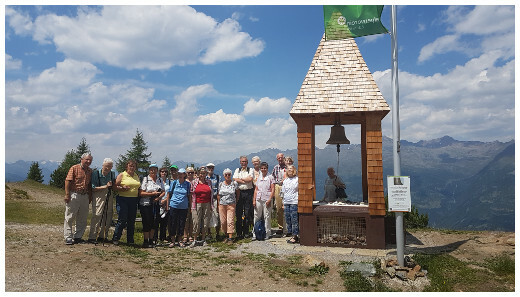 The memory of those events also inspired Mrs. Elizabeth Ziegler-Duregger to have a very special monument built on a mountain overlooking Lienz and the Drau valley. It has to be said that we only got there after a few hair-raising manoeuvres by the coach – special credits are due to our driver! 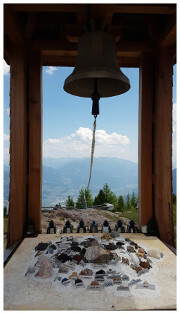 The Friedensglocke can be rung by anybody who wants to have his or her wish for peace to be heard. It is an international project with supporters all around the globe - witness the collection of stones from far-flung countries. Mrs Elizabeth Ziegler-Duregger and her friend Suzanne went out of their way to make our trip a success and to make us feel most welcome – in which they certainly succeeded, quite spectacularly so. Warm thanks to both of them! Our lunch took place at the Hochstein Hütte close to the Friedensglocke at over 2,000m. We rounded off our day, relaxing over ice cream in the old town of Sterzing.